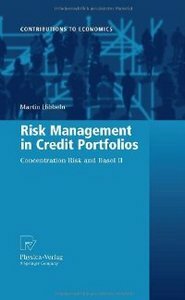 How do you model concentration risk of credit portfolio in IRB/Basel II framework? There is a fairly recent (2010) monograph by Martin Hibbeln entirely devoted to this very question. He starts with the standard Asymptotic Single Risk Factor model and shows how it can be modified in order to be consistent with the Basel II framework. He also compares the accuracy and runtime of several modern models which have been developed to measure sector concentration risk. Via Liquidity Horizons $LH$ (which have to be taken into consideration anyway when modelling for $Basel_3$) as function of the specific concentrations $c$'s. Increasing the effective maturity of the contract, $M_0+LH_0$, by a quantity proportional to its concentrations with respect to different slicings magnifies the credit risk. $M_0$ is the maturity specified for the contract, $LH_0$ is the LH originally assigned (in the absence of concentration risk/interactions with other contracts). The weights $w$s are to be chosen as per $Basel_3$ directives. The presence of a horizon $LH$s selling period has to get reflected anyway/icebergs detection while deterministic selling point in time time/maturity of the contract as a point in time generates modelling risk. Not the answer you're looking for? Browse other questions tagged risk credit or ask your own question. How do you quantify credit risk? What is Treasury Credit Risk? What's the difference between credit risk and counterparty credit risk?